Frosted window film has infinite application. 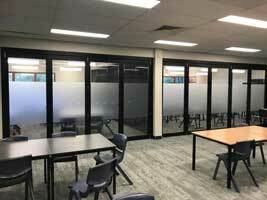 It turns any see-through window into frosted glass with a sand blasted or etched appearance. It looks sleek and modern, but more importantly creates complete privacy where it is applied. Frosting enhances your security and privacy, by keeping unwanted prying eyes from looking into your office or home. It is perfect for putting on the outside of your shower screen, glass panelled cupboard fronts (to hide the contents), laundries and the glass panels in and around front doors and is much cheaper than blinds and curtains. Frosting on internal glass surfaces will provide privacy in office spaces without making the inside of the office dark. It lets you do all of the above while still letting 90% of the warm natural light in all year round. A benefit you just can’t get with curtains, blinds or drapes. Frosting can be custom cut with designs to enhance the look and feel of the environment.